When will be the next CAFIB Expo ? Thesis on the CBKC-Fila: but how to equalize the existing heterogeneity of FB types in the CBKC-FCI ? Where will take place the next CAFIB-Northeast Expo? Result of the excellent and unforgettable CAFIB Itanhandu Expo with more than 100 FBs on track !!! With noble and fraternal praise from Quinzinho. Uncle Chico, unfortunately I could not attend the Itanhandu CAFIB Expo. When will be the next CAFIB Expo ? What a pity, you missed one of the best and most unforgettable CAFIB Expos. With more than 100 FBs on track. Excellent level of quality of FBs presented. Total homogeneity. A true PURE breed dog being displayed !!! See the Circular, photos and film indicated in my answer # 426 below. In contrast to the CBKC-FCI shows where there are few dogs on the track, there is no Temperament Test and persists the enormous heterogeneity and total diversity in the different types of Filas and “filas” on the track. See the links in answer # 426 below for undestand exactly what I mean. The next CAFIB Expo will be held in Jacareí-SP on May 20, and will be judged by Mariana Campbell and Pedro Borotti. 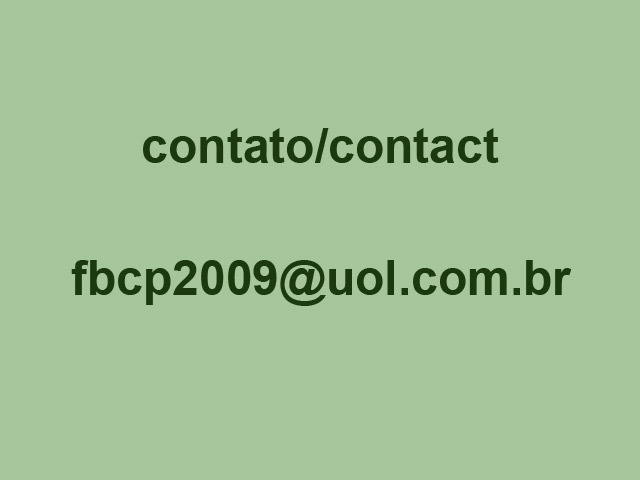 A very educational fact that should serve as an example for all Fila-CBKC-FCI breeders: the organizer of this expo is Flavio Pires, owner of the Canil Palmares, which started its breeding in 1988 in the CBKC-FCI System. He did not like CAFIB and hated the articles signed by Uncle Chico… lol… He even breed “black-fila” !!! In the meantime, in 2013, he began to take interest in getting to know CAFIB and studying its Breeding Philosophy, even helping to organize the CAFIB Expo of that year in Jacareí. So, he started attending our Expos, talking to CAFIB breeders and directors and also with Uncle Chico and in 2015, finally convinced that FILA IS CAFIB and that “black-fila” does not exist being just a mestizo or mongrel dog, joined CAFIB and abandoning its breeding based on CBKC-FCI Standard and Rules. He acquired Pure Filas from CAFIB’s even competing with his excellent female named Baiuca do Balacobaco fifteen Temperament Test, winning in nine; winning Best Head once and in the years 2015, 16 and 17 Baiuca was a Triple Champion as Best Female and Best Temperament of the CAFIB Annual Championship. http://www.filabrasileirochicopeltier.com.br/7.html and several articles in English in http://www.filabrasileirochicopeltier.com.br/1-eng.html ). Please see below some photos of the breeder Flávio Pires LATER, that is, ALREADY as a CAFIB member: What do you prefer? After all, hundreds of typical, homogeneous and PURE FBs can only be found in CAFIB !!! After all, What do you prefer? I believe that this example above of Flávio Pires should be especially useful for a minority of the so-called Fila-CBKC breeders based in the Brazilian Northeast who insist on reinventing and re-fabricating the “black-fila“, but curiously and incongruously, they love so much the black color coat… that they cross their enormous, black and big head dog with pedigree of CBKC-FCI with Pure Filas registered at CAFIB of yellow color coat … !!! ??? That is, in an illogical, irrational, inappropriate, absurd, inconvenient and incompatible with the history of the great characters of the Brazilian Northeast region, since, as we learned in the Brazilian book written by the very famous writer Euclides da Cunha‘s named “Os Sertões” (*): “The Brazilian northeastern people is, before everything, a very strong people“. 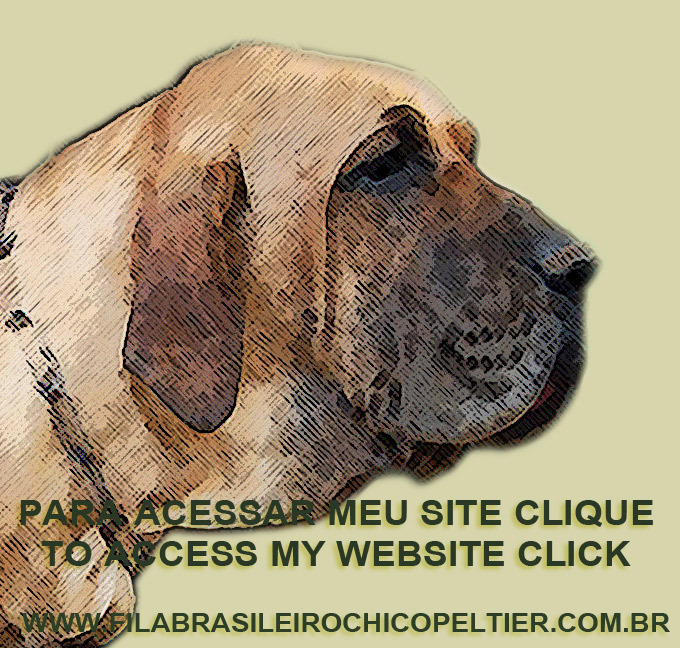 I am sorry that these northeastern re-inventors and “remakers” of the so-called “black-fila” mestizo dog are so weak and foolish, not being able to understand the evil they do against the Fila Brasileiro by registering mongrel dogs – but with commercial value for those who are unaware of the True FB – in the CBKC-FCI squad which, as we all know, accepts any type of enormous and big head dog as being a Pure FB. Uncle Chico, do you know the thesis titled “Phenotypic Variation in FB Breed” by Julian Dias dated 2012? Yes. I received it last week from a breeder who is a very close friend of mine and a great collaborator of Goiás. Even though I did not have enough time to read this work properly due to my professional commitments, I found it very interesting and very well substantiated. So much so that I passed it on to the entire board and judges of CAFIB. I only had one very big question and for this I tried to get in touch with the author, but I did not succeed. My question is: having the Fila and “fila” breed and registered in the CBKC-FCI so many heterogeneous dogs types due to the continuous miscegenation that still exists in these two clubs, I was very curious to know what kind of CBKC-FCI FB type dog was used by the author to carry out this work? After all, how can someone study and equalize the different types of “fila” bred and registered in CBKC-FCI if they are called until today as: “stocky-fila, toy-fila, pet-fila, masttiff-fila, neapolitan-fila, black-fila, giant-fila, roitt-fila, bloodhound-fila, docile-fila, hairy-fila, heavy loaded-fila” and most recently nicknamed them as “SMI = Super Shocking Molosser”… That is, as I have designated them over 4 decades ago, even before the CAFIB foundation: : “filamarquês (*) and genetic-salad-fila”. I think these Brazilian northeastern re-inventors know very well that if they cross “black-fila ” with “black-fila” with the pedigree issued by CBKC-FCI they will possibly return to the Black-Great Danes and the Black Neapolitan Mastin… This is why they cross their black mestizos dogs with Pure CAFIB Fila in yellow color. That is, to try to improve the phenotype of these mestizos dogs making them more similar to the CAFIB phenotype !!! That simple ! Chico, I was told that the next CAFIB Expo in the Brazil Northeast will be held at a little farm of a CBKC-FCI “black-fila” re-inventor. It is true ? Those who sponsor the CAFIB Expos are the cafibeanos (CAFIB people). But FBs, breeders and exhibitors from all clubs can participate. Everyone is warmly welcomed and politely received. Uncle Chico, what was the result of the excellent CAFIB Itanhandu Expo with more than 100 Pure FBs on track? It was another CAFIB record. Congratulations to the organizers, Cintia and Gerson Junqueira, owners of the traditional and very famous Canil Itanhandu, founded in 1984, for the accomplishment of another excellent Expo and another beautiful celebration party of CAFIB and the Pure-Fila, which ended at 10:30 pm in the track. And that continued until later due to the magnificent dinner prepared by Mrs. Elza Júlio. From the Analyses of Phenotype and Temperament (APT – see in English in http://www.filabrasileirochicopeltier.com.br/fila-brasileiro-filas.html ), 16 dogs participated and only 2 were rejected by Disqualifying Temperament. 101 FBs participated from the Expo in the track and were judged. As part of the celebrations of the 40th anniversary of the founding of CAFIB, Airton Campbell, Américo Cardoso and Luiz Antônio Maciel, as founders of CAFIB and Chico Peltier, as Father of CAFIB were honored at this event. Itanhandu Kennel: 34 years breding CAFIB Pure Fila = example to be followed by all FB breeders, especially those from CBKC-FCI. To breed FB is to be aware that it is the most difficult dog to be breed in the world, due to the enormous miscegenation that has never faced by BKC-CBKC-FCI. And know the pleasure you feel when you really breed and share the friendship with a PURE Fila Brasileiro !!! “Okay, Chico. Once again my congratulations to all who worked for the FB in this event. Just clarifying: my call was a personal attitude and also from the presidency of Amfibra, recognizing a good job on the FB breed that we both promote, without any political or even less secretive. There would be no reason for it, would it ? That is why I abstained from any other direct communication to CAFIB. I Understand that you could perfectly forward my vows, but I will also release you from any kind of restriction on the disclosure of our conversations (this or any other). Hence the mention of “Uncle Chico”, without any greater or furtive intentions. That simple as this. Hugs,“. Quando será a próxima expo do CAFIB? Tese sobre o Fila-CBKC: mas como equalizar a heterogeneidade de tipos existente no CBKC-FCI ? Onde será realizada a próxima Expo do CAFIB-Nordeste ? FBs Puros do CAFIB em pista !!! Com nobre e fraternal elogio do Quinzinho. Tio Chico, infelizmente não pude ir a Expo do CAFIB em Itanhandu. 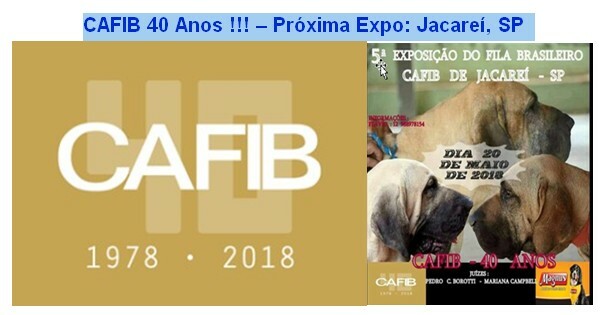 Quando será a próxima expo do CAFIB? Pena, voce perdeu uma das melhores e mais inesquecíveis Expos do CAFIB. Com mais de 100 FBs em pista. Excelente o nível de qualidade dos exemplares apresentados. Homogeneidade total. Uma verdadeira raça canina PURA sendo exibida !!! Veja na Circular, fotos e no filme indicados na resposta nª 426 abaixo. Ao contrário das expos realizadas pelo CBKC-FCI onde impera o pouco numero de cães em pista, a falta de Teste de Temperamento e a enorme heterogeneidade e diversidade total nos diversos tipos de Filas e “filas” em pista. Veja nos links da resposta nº 426 abaixo exatamente me ao que me refiro. A próxima Expo do CAFIB será realizada em Jacareí-SP, no dia 20/05/18 e será julgada por Mariana Campbell e Pedro Borotti. Um fato muito educativo e que deveria servir de exemplo para todos os criadores do Fila-CBKC–FCI: o organizador desta expo é Flavio Pires, proprietário do Canil Palmares, que começou a criar em 1988 no Sistema CBKC-FCI. Ele não gostava do CAFIB e detestava os artigos assinados pelo Tio Chico… rsrsrs… Chegou a criar até “fila-preto” !!! Entretanto em 2013 começou a se interessar em conhecer o CAFIB e estudar sua Filosofia de Criação, ajudando até a realizar a Expo daquele ano em Jacareí. Assim, passou a frequentar nossas exposições, conversar com nossos criadores e diretores, com o Tio Chico e em 2015, finalmente convencido que FILA É CAFIB e de que “fila-preto” não existe sendo apenas um cachorro mestiço ou vira lata, associou-se ao Clube, abandonando a sua criação baseada no CBKC-FCI. Adquiriu Filas Puros do CAFIB chegando a disputar com sua excelente femea Baiuca do Balacobaco quinze Provas de Temperamento, saindo-se vencedor em nove; ganhando uma vez Melhor Cabeça e nos anos de 2015, 16 e 17 Baiuca foi Tricampeã como Melhor Femea e Temperamento do Campeonato Anual do CAFIB. Relato este fato, pois a historia e crescimento cinófilo de Flavio Pires no FB deveria ser copiado e seguido pelos criadores de Fila e “fila” do CBKC-FCI que há anos insistem em criar “fila-mestiço”, “fila-aberração” e “fila-preto”. (vide em http://www.filabrasileirochicopeltier.com.br/7.html ). Flávio Pires: exemplo a ser seguido pelos criadores de Fila-“fila” do CBKC-FCI, como os Harrisons, Costas, Wolners, Baccis, Blumens, etc… Afinal, centenas de FBs Típicos, homogêneos e PUROS só se encontra mesmo no CAFIB !!! Afinal, o que voce prefere ??? Creio que este exemplo acima do Flávio Pires deveria servir especialmente para uma minoria de criadores do chamado Fila-CBKC baseados no Nordeste que insistem em reinventar e re-fabricar o “fila-preto”, mas que, curiosa e incongruentemente, gostam tanto, mas tanto mesmo da pelagem negra… que cruzam seus cachorros grandes, cabeçudos e pretos com pedigree de FB do CBKC-FCI com Filas Puro do CAFIB de pelagem amarela… !!!??? Ou seja, numa atitude ilógica, irracional, inadequada, absurda, inconveniente e incompatível com a história dos grandes personagens do Nordeste brasileiro, já que, como aprendemos no livro “Os Sertões“, de Euclides da Cunha: “O nordestino é, antes de tudo, um forte“. Sinto muito que estes reinventores e “fabricantes” nordestinos do mestiço chamado de “fila-preto” sejam tão fracos e tolos, não sendo capazes de realizar o mal que fazem contra a Raça Cão de Fila Brasileiro registrando cachorros mestiços – mas com valor comercial para aqueles que desconhecem o Verdadeiro FB – no plantel do CBKC-FCI que, como sabemos, aceita qualquer cachorro grande e cabeçudo como sendo FB. Tio Chico, voce conhece a tese intitulada “Variação Fenotípica na Raça FB” de autoria de Julian Dias e datado de 2012 ? Sim. O recebi semana passada de um criador muito amigo meu e grande colaborador de Goiás. Mesmo não tendo o tempo suficiente para ler com a devida calma este trabalho devido à correria profissional, achei-o muito interessante e bem consubstanciado. Tanto que o repassei para toda a diretoria e juízes do CAFIB. Fiquei apenas com uma grande duvida e por isto tentei entrar em contato com o autor, mas não obtive sucesso. Minha dúvida é: possuindo o Fila e “fila” criado e registrado no CBKC-FCI tantos tipos caninos tão heterogêneos devido a continua mestiçagem até hoje existente nestes dois clubes, fiquei muito curioso em saber que tipo de cachorro do CBKC-FCI foi utilizado pelo autor para realizar este trabalho ? Afinal, como alguém pode estudar, equiparar e equalizar os diversos tipos de “fila” criado e registrado no CBKC-FCI até hoje que são chamados de: “fila-atarracado, fila-toy, fila-pet, mastifila, napofila, fila-preto, fila-gigante, roitt-fila, blood-fila, fila-dócil, fila-peludo, fila-pesado, fila-carregado” e, mais recentemente de “SMI = Super Molossóides Impactantes”… Ou seja, como eu os designei há mais de quatro décadas atrás, antes mesmo da fundação do CAFIB: “filamarquês e fila-salada-genética” ??? Pois é, muito triste, não é mesmo ? Penso que estes reinventores nordestinos sabem muito bem que se cruzarem “fila-preto” com “fila-preto” com pedigree do CBKC-FCI possivelmente retornarão ao Dinamarquês-preto e ao Mastin Napolitano-preto… Por isto cruzam seus mestiços pretos com Fila Puro do CAFIB na coloração amarela. Ou seja, para tentarem melhorar o fenótipo destes mestiços tornando-os mais parecidos com o fenótipo do CAFIB !!! Simples assim ! Chico, me disseram que a próxima Expo do CAFIB no Nordeste será realizada num sitio de um reinventor do “fila-preto” do CBKC-FCI. É verdade ? Quem patrocina as Expos do CAFIB são os cafibeanos. Mas delas podem participar FBs, criadores e expositores de todos os clubes. Todos são muito bem vindos e educadamente recebidos. Tio Chico, qual foi o resultado da excelente Expo de Itanhandu com mais de 100 FBs Puros do CAFIB em pista? Foi mais um recorde do CAFIB. Parabéns aos organizadores, Cintia e Gerson Junqueira, proprietários do tradicional e famoso Canil Itanhandu, fundado em 1984, pela realização de mais uma excelente Expo e mais uma linda festa de confraternização do CAFIB e do Fila-Puro que terminou as 22:30 horas na pista. E que continuou até mais tarde devido ao magnifico jantar preparado por Dona Elza Júlio. Da Análise de Fenótipo e Temperamento participaram 16 cães e somente 2 foram reprovados por Temperamento desqualificante. Da Exposição participaram em pista e foram julgados 101 FBs. Como parte das comemorações dos 40 anos da fundação do CAFIB foram homenageados neste evento Airton Campbell, Américo Cardoso e Luiz Antônio Maciel, como fundadores do CAFIB e Chico Peltier, como Pai do CAFIB. Canil Itanhandu: 34 anos criando Fila-Puro do CAFIB = exemplo a ser seguido por todos os criadores de FB, principalmente os do CBKC-FCI. Criar FB é ter consciência que se cria a raça canina mais difícil do mundo, devido a enorme miscigenação jamais enfrentada pelo BKC, CBKC e FCI. E conheçam o prazer que se sente ao criar e dividir a amizade com um Verdadeiro Cão de Fila Brasileiro PURO !! !